View is what an end user can see. 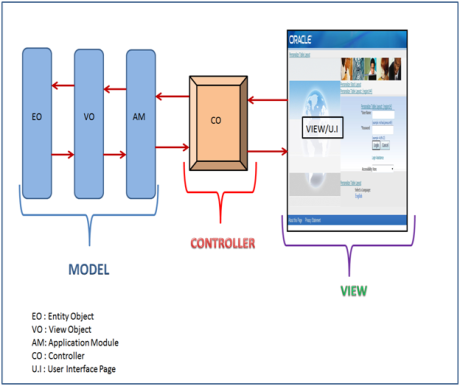 In Oracle Apps Framework View is implemented using UIX technology, whereas UIX means User Interface XML. Whenever we run the page in JDeveloper then automatically UIX will generate web.xml file. The power of UIX is that allows metadata to be translated to an HTML page for a web browser or mobile device browsers. The generated web.xml file will be converted into HTML format of OAF page. Since web.xml file here will work as a cache memory. Whenever we want to move the web.xml file into the server side then MDS repository is used to move the web.xml file into the server. MDS stands for Meta Data Service and in the application top we will be having MDS folder. When we deploy all the OAF page destination paths, regions then the files will be stored into the MDS tables. JDR_Paths:Stores the path of the documents, OA Framework pages and their parent child relationship. JDR_Components:Stores components on documents and OA Framework pages. JDR_Attributes:Stores attributes of components on documents and OA Framework pages. JDR_ATTRIBUTES_TRANS:Stores translated attribute values of document components or OA framework pages. JDR_DOCUMENT_ID_S: This is a sequence generator table. MDS can be managed using standard database procedures and tools. How To Debug OAF Pages When Its Going Into Error!! FNDLOAD Download And Upload Commands For Different AOL Components!! Most Frequently Used Oracle Workflow Queries! !